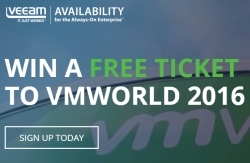 Want to win a free VMworld 2016 Conference Pass? Full list here! You want to attend VMworld 2016 in Las Vegas or Barcelona but your boss/company won’t or can’t pay for the ticket? Then try your luck and win your conference pass to the show in one of the many sweepstakes. As in the last years I try to put together a full list with all the possibilities where you can win tickets for VMworld 2016 US and Europe. If one is missing please leave a comment or write me a short info via Twitter @lessi001. And do not forget to check back to this site over the next weeks as I will add more and more raffles where you can win your ticket to the show! As last year VMTurbo raffles full conference passes for Barcelona, too! There are three drawings: August 5, August 19 and September 9. (VMworld US) As last year VMTurbo raffles full conference passes, too! There are three drawings: May 27, June 17 and July 15. Veeam sends ten lucky winners to VMworld 2016 US or Europe. From March to July 2016 two winners will be announced every month. So do not hesitate and register today to win! So check back to Running-System.com in the next weeks to find more raffles to win your ticket to VMworld 2016!